While you might think that chickens are the easiest way to backyard egg laying success, ducks and geese also produce tasty and nutritious eggs. With their own distinctive qualities, duck eggs and goose eggs can add a unique flair to your farm stand or small egg business, or they can just make breakfast a little bit different. Read on to learn about the best duck and goose breeds for egg laying. 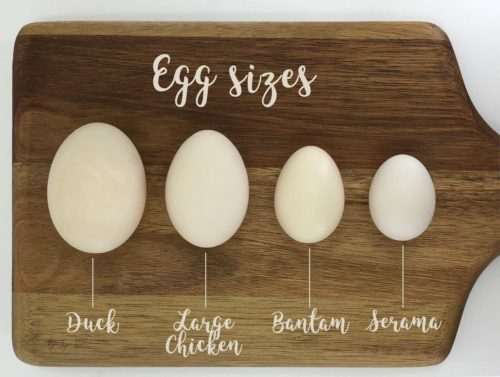 Duck eggs are slightly larger than chicken eggs, with thicker shells. Inside, the yolk is much larger and a deeper orange than inside a chicken egg. Duck eggs are about 130 calories and are generally considered to be more nutritious than chicken eggs. Ducks are excellent egg layers that can continue laying through the dark winter months when chickens become less reliable. With larger yolks than chicken eggs, duck eggs offer a deeper color to a batter than chicken eggs and also will taste more creamy and rich when fried or scrambled. And duck eggs can fetch a premium compared to chicken eggs, because they are harder to find. The backyard poultry enthusiast can expect to make between $6 and $12 per dozen for duck eggs. Every breed of duck lays eggs, but some are more prolific or interesting in their egg production. The most astonishing egg-laying duck is the Cayuga. These shiny black birds will begin every spring with amazing, ink-black eggs. Over a week or a month, the egg shells will slowly become grayer until they’re laying standard white eggs again. These first few black eggs every year are a guaranteed conversation starter and always illicit oohs and aahs from egg buyers. Perhaps the best for production of duck eggs is the Khaki Campbell. These pretty brown ducks can lay over 200 eggs a year, and their sweet temperaments also make them desirable for the smaller farmer. 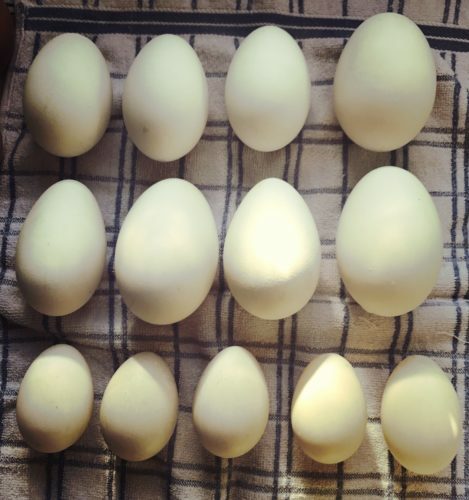 Runner Ducks are also a great choice for the backyard farmer’s egg production. High energy foragers, Runners have a very upright stance and their eggs can range from tinted blue or gray to a cream color. Some types of Runners are more prolific than others, but most lay between 100 and 180 eggs a year. 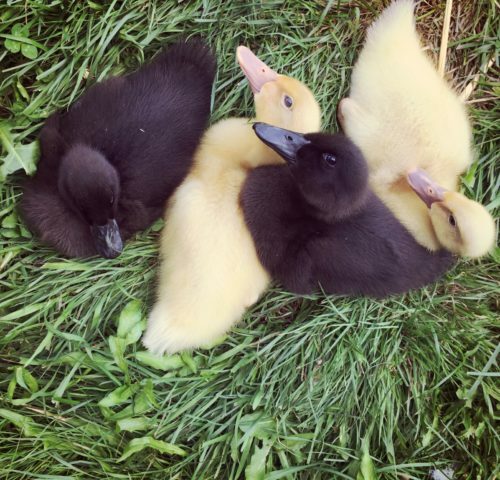 Other breeds to consider for duck egg production include the pretty, cream egg laying Welsh Harlequins; the gray egg laying Black Swedish; or the lovely fawn color and cream egg laying Buff. Geese are highly seasonal egg layers who will produce eggs between approximately February and June. While you cannot rely on them for year round egg supply, the rarity of their eggs can make them a delicacy. And they make up for their scarceness by being huge, equivalent two about three chicken eggs. 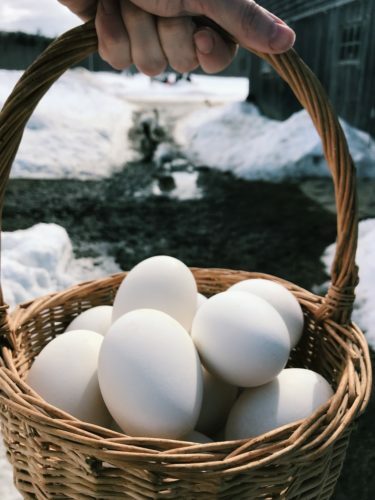 Goose eggs can fetch $1 or $2 an egg, or up to $20 for a half dozen depending on where you are selling them. Like duck eggs, goose eggs have larger yolks and are more nutritious than the average chicken egg. And they are even thicker in a batter than duck eggs, holding together and creating a thick mixture for batters. Because of that thicker quality and their rich orange yolks, goose eggs are particularly sought after for batters, pasta-making, and rich desserts. But they can be used in place of chicken eggs anywhere, and are especially nice for omelets because of their size. All geese lay large white eggs with thick shells. While some are more prolific than others, the focus in goose breeding over the years has not been on egg production so few individuals lay more than 30 or 40 eggs in a season. The most prolific goose breeds tend to be African and Chinese geese, both breeds also known for their loud voices. They lay around 40 eggs in a season, but they are not always ideal for the backyard farmer because of their active foraging, occasional aggressiveness, and talkativeness. Instead, backyard farmers may want to consider the Sebastopol. These amazing looking birds are reliable egg layers and excellent mothers, and they are quite and docile on the small farm. 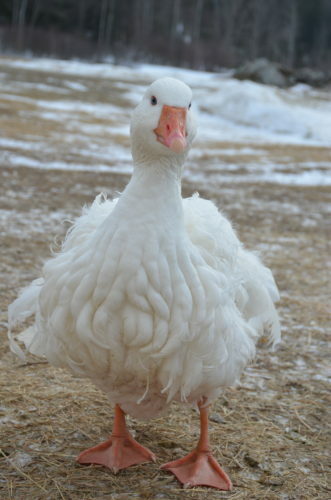 Other goose breeds with reliable egg production include Toulouse, the beautifully colored Buff, and the petite Roman Tufted. Expanding your backyard flock to include more waterfowl can lead you to experimenting with new kinds of eggs in your kitchen or on your farm stand. While they’re all delicious, you may end up finding that you prefer duck eggs or goose eggs to chicken eggs. Kirsten Lie-Nielsen keeps chickens, a gaggle of geese and goats at her farm in Liberty, Maine. She and her partner are rebuilding an 1820s farmhouse while turning overgrown fields back into orchards and gardens. When not working on the farm and tending her geese and other animals, Kirsten writes about her experiences at her blog and has written two books, The Modern Homesteader’s Guide to Keeping Geese as well as So You Want to Be a Modern Homesteader? : All the Dirt on Living the Good Life. Follow her on Instagram: http://instagram.com/hostilevalleyliving or visit her blog at hostilevalleyliving.com.